Perspective is one’s thoughts, views, opinions, and responses leading to a reality about something. Perhaps some of you are aware that I had taken a hiatus, a vacation, or simply have not been present. Quite the opposite I had nothing to write about or shout about. During an obvious record breaking summer with temps hovering around 83 degrees with a light breeze it was apparent that yes something was different. We’re inundated daily with the on and off cease fire between Israel and Hamas and the human devastation along the Gaza Strip. Lurking in the background teetering along there’s the advancement of Russia into Ukraine. Ebola took center stage worldwide but for unobvious reasons has disappeared from the morning news outlets. I’m giving no mention and credit to that group of derelicts rampaging lawlessly across Iraq and Syria. Back home here in America, things are not so quiet along the southern border, business as usual. The unemployed are still unemployed. Out in the Midwest a small town called Ferguson, Missouri finds a moment to catch its breath, to mourn and account for the death of a young man on a day where the actions of two spun out of control. Just as we’re going to bed or heading off to work , Napa shakes back and forth attempting to adjust to the inevitable, “Big One”. It would be very easy to stop here blaming and criticizing each other for all the events happening in our homes and neighborhoods across this great country but I will not in this article. Crazily, we keep building and growing and talking again about new beginnings. All of this has happened amidst so much that it would take more than the rest of my life to document or digest. However, I want to shine a beam of light on the little league team from Chicago, Jackson West who found themselves in the Little League World Series against a very repeated tough opponent ,South Korea this past weekend. This little league team on a field of dreams are forever victorious. These kids or little league players are exceptional quite frankly because they are and continue to be Black, not only Black but Black Americans. They have managed for the moment not to be a statistic in their own neighborhoods riddled nightly often with violence. Juxtaposed, across the country in my quaint and quiet neighborhood of Glover Park DC, two Saturdays ago I found myself perched between one of the teams who had found themselves again vying for their fifth championship. 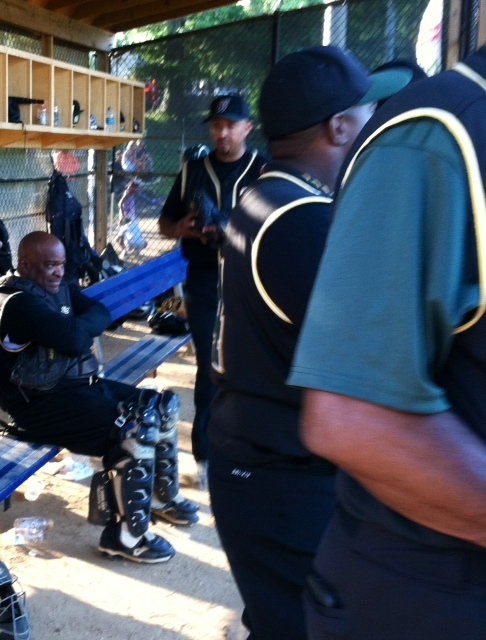 Here I met Lamont McKenzie, Catcher for the DC Warriors (pictured above) who I spent part of the afternoon in conversation reminiscing about the love of the game, our city, neighborhood, and DC Fast Pitch Softball. I had so much fun that afternoon revisiting mentally my days as a kid in West Virginia, playing softball in the middle of the afternoon, barefoot, with no glove to catch the ball. You had to be there, a place to watch a bunch of proud men play the real round ball game with a bat while catching up on all the family and social stuff. By the way, The Warriors went on to beat the Colts in the championship of the DC Parks and Recreation Fast Pitch Softball League this past Sunday. Three days have since passed. The President is back in town. School is back in session. Michael Brown was laid to rest. Things are quiet and celebratory along the Gaza Strip. Bilateral talks begin between the leaders of Russia and Ukraine. In an unconscious way we continue, though challenging, making what seem so small on the world’s stage accentuating the positive and all of our attributes, failures, and successes along a field of dreams! Curt Canada- Board Certified Coach, consult and advise clients collaboratively in Washington DC and abroad @Adapting2change.